Balances the Load on the Upper Body Muscles A traditional keyboard requires right-handed users to use the same hand for keying in numbers, and for mousing. This repetitive back and forth motion at the same shoulder joint can lead to fatigue and injury in that muscle group. 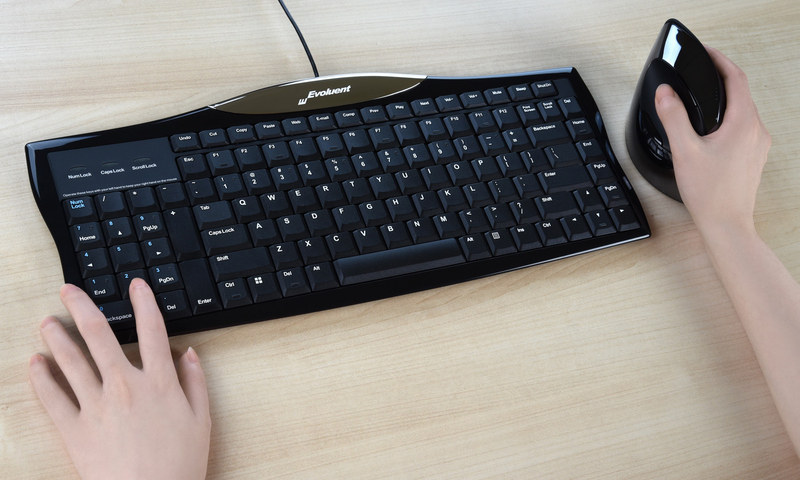 Using the Evoluent Reduced Reach Right Handed Keyboard, users can distribute the workload more evenly, keying in numbers with the left hand, and mousing with the right. 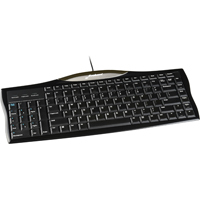 Reduces Risk of Overreach Injury By placing the numeric keypad on the left, the Evoluent Reduced Reach Right Handed Keyboard allows those who mouse with the right hand to place the mouse within the Comfort Zone. 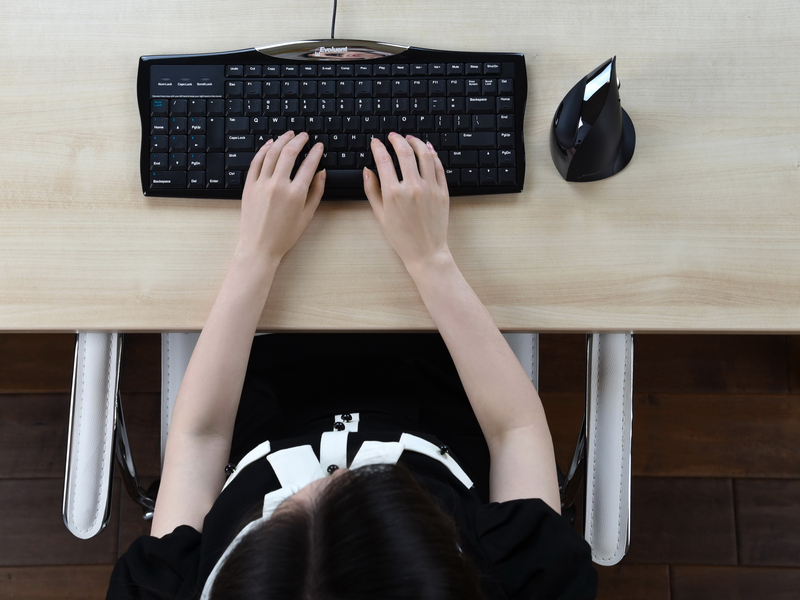 When the mouse is in line with the shoulder, users no longer need to overextend the shoulder joint and the risk of injury drops significantly. Learn More About Overreaching. Reduces Risk of Wrist Extension With only 0.4” between the work surface and the top of the keys, the slim design of the Evoluent Reduced Reach Right Handed Keyboard helps users avoid the unhealthy upward bend at the wrists, known as wrist extension, that contributes to fatigue, pain and numbness in the forearms, wrists and hands. Learn More About Wrist Extension. 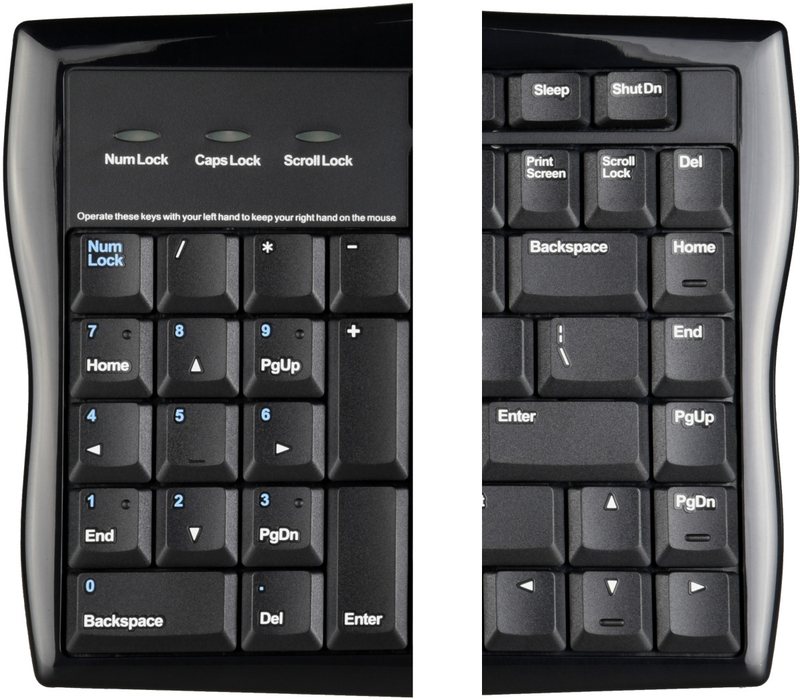 Numeric Keypad on the Left: Allows those who mouse with the right hand to bring the mouse into the comfort zone, without sacrificing the convenience of a built-in numeric keypad. Blue Legends: The numeric keypad features blue legends as a visual cue to help users adapt quickly and easily to the non-traditional layout. Low Profile: The slim housing (only 0.4" high) reduces the potential for wrist extension. 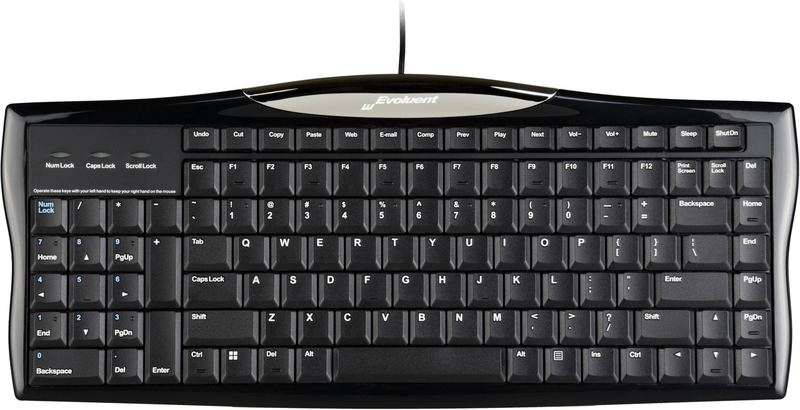 Two Sets of Navigation Keys: Page Up, Page Down, Home, End, and arrow keys are located on the left and the right hand sides of the keyboard to help the user adjust as quickly as possible to the new layout. 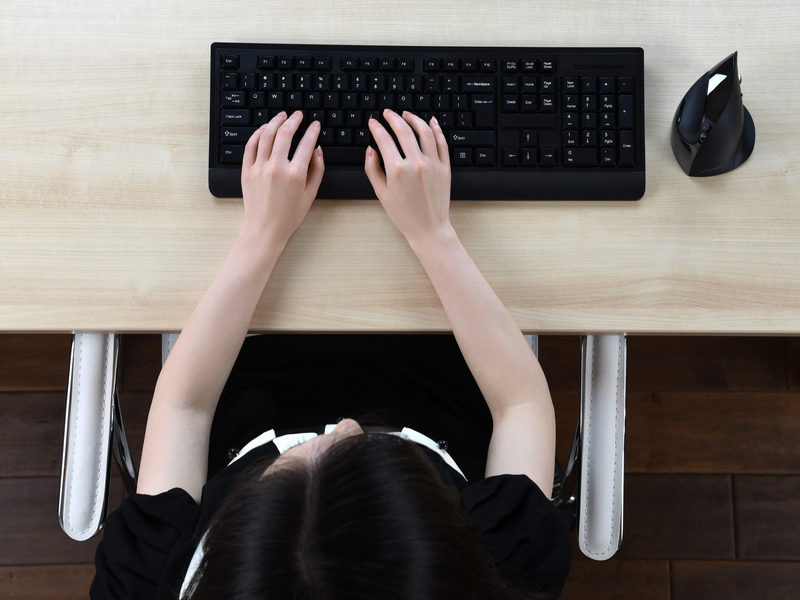 Three Delete Keys: Three delete keys (one on the numeric keypad and two on either side of the space bar) allow access with the left or right hand. Tactile Bumps on Frequently Accessed Keys: Tactile dots and ridges on important landmark keys help experienced typists navigate the keys by touch. Windows Hotkeys: Hotkeys offer one-touch access to frequently needed functions such as Undo, Cut, Copy and Paste, to applications such as browsers, email clients, and media players, and to volume controls, sleep and shut down commands. High Quality Scissor-Switch Membrane Keys: Precision scissor-switch membrane keyswitches provide crisp keying action and fast snap-back of the keys after actuation. Highly Visible Key Lock Status Indicators: Activation of NumLock, CapsLock and Scroll Lock is clearly indicated above the numeric keypad.